It’s no secret that the arts, and live performance in particular, have long struggled with the notion of providing accessibility for patrons with disabilities. Recently, the Eastern Michigan University Theatre program took steps towards providing a more inclusive theatergoing experience with the help of Elena Sanchez Flys, an assistant professor of Arts Administration with a passion for accessibility design. This season, two of EMU Theatre’s shows (James and the Giant Peach and Much Ado About Nothing) offered accessibility services such as American Sign Language, audio description, captions, tactile tours and programs in both large print and Braille. In addition, both shows offered sensory friendly performances – special performances designed to create a safe and welcoming experience for patrons with sensory disabilities such as those on the autism spectrum, as well as people with other sensory sensitivities. Since EMU is the home of the Entertainment Design & Technology (ED&T) major, a number of productions have student designers and/or technicians working on shows. For the recent production of Shakespeare’s Much Ado, the production team featured students in a number of design roles, such as lighting designer, projection designer, assistant sound designer, and assistant accessibility designer. Becca Bedell, the lighting designer for the production, was tasked with creating a design that addressed the needs for accessible and sensory-friendly performances. One major component was the use of special “warning lights” for sensory friendly performances. In previous shows, accessibility performers had been positioned onstage and used colored glow sticks to indicate various stimuli (red for loud sounds, yellow for bright lighting / strobes, and blue for actions which might create stimulation). For this performances, Ms. Bedell wanted to replace the glow sticks with lights used to splash color on the side walls of the theatre as indicators. Since the warning light system would not be used for every performance, she decided on creating a separate lighting control system that would be independently controlled by a member of the accessibility design team. To pull this off, I worked with Becca to create a QLab lighting control rig, using QLab running on a MacBook Pro, an ENTTEC OpenDMX Ethernet interface, and a small array of Chauvet Freedom PARs provided by TLS Productions Inc.
QLab proved to be the perfect choice for setting up a lighting control system. QLab 4 added Light Cues to its already formidable array of media and show control options, allowing you to control lighting systems over ArtNET ethernet interfaces or certain varieties of USB/DMX controllers. For our system, we connected an ENTTEC OpenDMX Ethernet interface to the MacBook Pro’s Ethernet port and ran a 5-pin DMX out from the interface into the Freedom PAR’s wireless DMX transmitter. With a quick amount of programming, we were able to add four basic Light Cues to send control signals to the Freedom PAR’s – red, amber, blue, and blackout. The QLab workspace featured four Light Cues, each programmed for a specific function of turning on a specific color of light, or triggering a systemwide blackout. This lighting system would be operated by a crew member positioned in the theater’s trap room, watching a live audio/video feed of the performance and following along on a marked script (similar to a traditional stage manager). This person had no previous experience in operating a light board, so we decided to create a user-friendly interface custom made for the show that would require minimal training to operate. Once again, QLab offered a great solution to this problem in the form of its Cue Cart function. A Cue Cart allows the user to create a grid-style interface with buttons to trigger cues in the workspace. We programmed three simple color-coded buttons that allowed the operator to click a button and trigger a colored light (red, amber, or blue). The light would stay on until the operator clicked the blackout button, which was programmed to fade out any light in the workspace. Since all of the Freedom PAR’s were addressed to the same control channel, this meant that the operator could easily control all of the lights in the rig at the single touch of a button. The Cue Cart made for a simple control interface. The fact that each button was labelled and color-coded allowed even a novice operator to quickly feel confident using the system. We discussed the pros and cons of having a system in which the cue carts would be connected to a MIDI push-button interface that allowed for a pushing a button to turn on the lights and the light turning off when the button was released, but decided on this approach of lights being on until turned off for fear of the operator accidentally creating a strobe effect by bumping the MIDI buttons. The only downside to the method we settled on was a need to turn off the lights by pressing the blackout button each time, but after a quick discussion with the operator we felt this would be the safer approach. Technology is always changing and giving us new options for problem solving. Luckily, these changes are allowing us to become more creative in the ways that we build inclusive theatergoing experiences. I would love to hear some of the ways that you’ve been able to use tech to bridge these gaps. As always, feel free to share your thoughts! For years, I had a collection of stock answers prepared for people asking “what do you do?” I am a professor. “What do you teach?” I teach scenery and lighting for the theatre. That would typically lead to an array of questions that most of us in the arts are used to fielding (yes, people make money doing that). These days, my work has led me more into the field of Media Design. To be honest, I tend not to throw that word around a lot when asked what I do, because the Q & A can become a bit more convoluted. Why is that? Well, to be honest, I don’t think we have really arrived at a catch-all description for what Media Design is and how it fits into the production process. If you’re new to this discussion, let me recap a bit for you. What is Media Design? In general terms, when people are talking about Media Design (particularly for theatre, opera, and dance) they mean the use of original video content, live video feed, and motion graphics displayed in some way as a visual component of the performance (projectors, video walls, displays, etc). Sound suitably vague? The designer who receives credit for this work is not only responsible for content creation, but often also designs the system that displays the content. In this way, the designer has a hand on the content and delivery of the media for a live performance. The Threepenny Opera at Eastern Michigan University, 2017. Media Design and photo: Jeromy Hopgood. While I used the term Media Design for the field, we often find the artists themselves referred to by other titles, such as the Projection Designer, or Video Designer. In fact, The United Scenic Artists Local USA829 represents their designers under the category called Projection Design. This can become a little confusing, though, if we’re talking about a show that has lots of video and graphic content displayed across video walls. Is it still projection design if there are no projectors involved? So, here we have the union that represents our designers referring to the field as one thing, the oldest theatre design and technology organization in the U.S. calling it something else, and a number of producers using completely different terminology. Should we, then, be surprised to find that reviewers often don’t know how to talk about the work of a Media Designer (don’t even get me started on the question of the Tony’s). Through all of this, you might be wondering how much does a name matter? It brings to mind the old adage “you can call me anything you want, so long as you don’t call me late for dinner.” While it is certainly true that the check will still clear whether the memo line reads Video Designer, Projections Designer, or Media Designer, at the end of the day, we all know that names have power. One Man, Two Guvnors at Eastern Michigan University, 2016. Media Design and Photo: Jeromy Hopgood. Content creation: Christine Franzen. Some people may like the autonomy of this setup. It does, however, lead to the question what is a design fee paying for? Is the designer expected to create all of the content (with all of the expenses connected with that), licensing fees, program the media server, design and install the system, and everything else that comes up along the way? In all likelihood, it depends on your market and how good you are at educating your employers. All of this revolves around the point that we are a young industry. Even though projections have been around for more than a century in some form or another, we are only now reaching a point of proliferation where Media Design is not an oddity around the production table. Even so, the mystique that surrounds or field remains commonplace. We have only recently hit the ten-year anniversary of projection design being added as a USA829 category, and we’re still a few years out from that benchmark with the first MFA in Projection Design at Yale School of Drama. That places the impetus on the designers and technicians of the field to engage in these important discussions with our peers and colleagues in the industry. We are our own best advocates. Even though these conversations may, at times, prove frustrating and circuitous, this is a wonderful time to be a Media Designer. I am so excited to be working with this next generation of artists just now making their way into the field and look forward to where we arrive, as a group. Feel free to share your own thoughts and observations related to this post. I’m always interested in a good conversation. One of the more exciting new features in QLab 4 is the Record Cue Sequence tool. This function enables you to play through a cue sequence manually while recording your precise playback timing. This process creates a Group Cue with Start Cues imbedded within to trigger your cue sequence. These Start Cues have pre-waits attached to them that enable an exact playback to match your timing. To use this function, click on “Record Cue Sequence” in your Tools menu. This will open a window that gives you two recording options. The Record Cue Sequence window, with both recording options shown. Both settings create a Group Cue populated with Start Cues to trigger cues in your workspace. The first setting enables all of the Start cues to fire simultaneously with the appropriate pre-waits attached to them to match your original timing. The second option creates a Group Cue that triggers the first Start Cue and then goes to the next cue with pre-waits and auto-continues attached in the appropriate locations. Both will result in identical playback, but you may find one method better suits the needs of your programming preferences. It’s important to note that the Group Cue created by this process only contains Start Cues. It does not have the cues necessary for playback of your media or triggering lights. In the interest of keeping an organized workspace, it might be wise to create another Group Cue inside which you place your cues and triggers. Another option is to create a new cue list and drag these files into that list. The important detail here is that your original media cannot be deleted, or the Start Cues will have nothing to trigger. It can take a bit of getting used to, but it certainly opens up a number of options for programming. Follow this link to watch a screen capture video showing playback of a recorded Audio Cue sequence. Keep checking in for more tips in the coming months and stay tuned for more news about my upcoming QLab 4 book. The last several years have been a period of exciting growth for the rapidly expanding team at Figure 53, the makers of QLab and other show solutions. If you look at the Company statement on their website, this pretty much sums up their business approach: “We work on shows to be together for something special, and we love helping people do that in ways they couldn’t before.” This November, Figure 53 took a huge leap forward in the realm of helping people do shows in a way they couldn’t before with their highly anticipated new release of QLab 4. While there are a lot of features to be excited about in this new release, the biggest new change is the addition of lighting control. QLab 4 brings along all of the wonderful components that have made it an industry standard in media playback and show control – sound control, video playback and effects, and show control integration through MIDI and OSC networks. The addition of lighting control, though, is a game changer for how designers and technicians approach QLab as a tool. QLab 4 allows for the control of lighting instruments and devices by using the Art-Net protocol over a network. This is either accomplished by directly “talking” to your lighting equipment through Art-Net, or sending the message through a node that translates Art-Net into a DMX signal. For those of you hoping to use a USB to DMX converter, you’re out of luck here. Art-Net nodes are currently the only type of interface recognized by QLab 4. You should know out of the gate that QLab isn’t going to replace your high end lighting console or work well with a modern rig with hundreds of movers and complex fixtures (at least not yet). Currently, it works best with a rig featuring conventional fixtures, dimmers, and simple RGB-style LED fixtures. I could really see this being an innovative control option for storefront theatres, site specific work, houses of worship, club settings, and industry / trade show installations. The biggest perk in my mind is the fact that it builds on the QLab cue system, so those who are already familiar with creating a workspace should be able to jump right in and experiment with lighting control pretty quickly. Lighting control is done through the use of a Lighting Cue within your workspace. For those familiar with QLab, this is just another cue type (like Audio Cues, Video Cues, Fade Cues, etc.) that can be combined into your workspace with all of your other cue types. This Lighting Cue contains all of the data for communicating with your equipment. Unlike traditional QLab cue types, however, Lighting Cue parameters are not changed by the use of a Fade Cue. Instead, values will be changed with additional Lighting Cues, or through the use of the new Light Dashboard. The dashboard shows you the live status of all currently running cues in your workspace and allows you to manipulate them in real time. This can be accomplished by using the built in sliders or tiles, or by using a command line that allows you to type in a textual control language. Like any other lighting console, QLab also has a patch system. In Qlab’s Light Patch, you create the instrument and patch them to their appropriate real-world Art-Net/DMX addresses. In QLab, an instrument represents any light or dimmer in your rig that you want to control. Each instrument that is added to your workspace becomes a part of the Definitions Tab, where you can assign instrument information and parameters (such as intensity, color, position, etc.). These parameters are then controllable by using the sliders or tiles assigned to it in the Light Cue. You can also create Groups within the patch for ease in controlling more than one instrument. In the example shown below, Cue 1.7 is controlling Group 1, a group with all front lighting instruments combined. The second image shows how the Light Dashboard would represent this visually. Cue 1.7 brings up the Front Light Group. In addition to adding lighting, there are quite a few changes to workflow and programming that will save you on programming time. One of the big new changes is what they are calling “Fancy Paste” that allows the programmer to copy and paste multiple cue properties from the clipboard onto one or more cues in your workspace. You can also customize your defaults for workspaces by using Cue Templates. My personal favorite is the Record Cue Sequence function, which watches and records a cue sequence as you play through it manually. Once you stop the recording, QLab will automatically create a Group Cue populated with Start Cues that match the playback timing of what you recorded. There are lots of things to be excited about in this new version of QLab. Like previous versions, I have no doubt that the folks at Figure 53 will continue to tweak their toolset and functions in response to user feedback. It’s possible that, in the right setting, a single computer running QLab could replace thousands of dollars worth of other equipment. This no doubt leads to all sorts of logistical questions (not the least of which being the amount of time and planning that would go into cueing a show if there were multiple designers on the same computer), but it will be interesting to see how this new component develops over the coming years and the ways in which the industry embraces it. 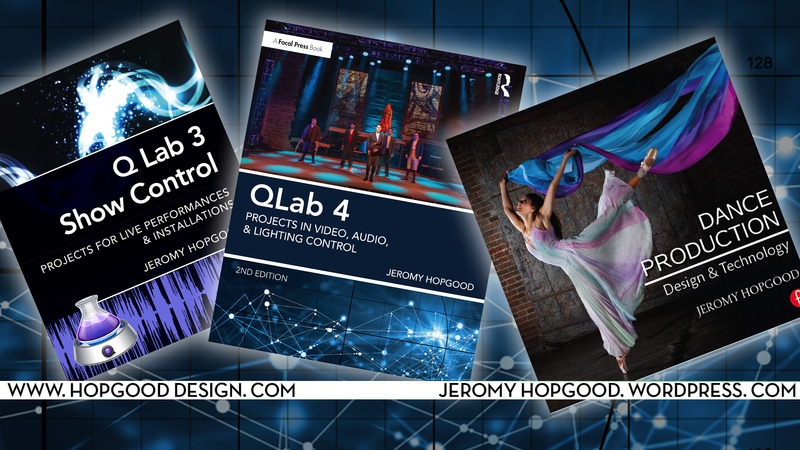 Stay tuned for some future posts on here about QLab 4 functions and my forthcoming QLab 4 Show Control book. *As always, the fine print still applies. I am not an employee of Figure 53 and my views are exclusively my own. I’m just a guy who appreciates useful software and believes in sharing with others. Just a quick note this morning, as I’m heading off to a load-in. For those of you who use and love QLab, there’s some exciting news around the bend. QLab 4 is on the way. If you want to be one of the first to get news about this new release, just go here. In the meantime, happy cueing! Welcome back to the second installation of my interview with Lucas Krech, one of the creators of Drafty, a new online CAD application. If you haven’t read Part One, you can do so by clicking here. 4. I notice that the program is delivered as a web app through your web browser. Why did you take that route? Our first paid customer was the Technical Design program at Bath-Spa University in the UK. We were still in Beta and had a ton of bugs. Being web-based we could see errors appear on our server logs and analyze the problem in real time. Fix the problem in real time. Deploy a software patch to our servers that the browser picks up automatically in real time. And then watch the errors disappear from the logs as each work station grabbed the new code. All in real time. 20 plus users every Tuesday working hard with Drafty for like two hours. It was amazing. There are also a ton of ancillary benefits. Imagine your fancy computer crashes the day before you are about to go on tour with a ballet company (happened to me once). Or worse you are on tour and have no time to get to a store. Currently you are out at least a $1000 on hardware and better hope your software works with the current OS or you may be out thousands there too. With Drafty you just grab any old laptop, open an Incognito window in Chrome to keep all your info private, and keep drafting. Also, because it leverages the web you don’t need to pay for those top end graphics cards to support the 3D engine you are never going to use anyhow. So Drafty works as well on a $400 laptop from Best Buy as it does on a fully tricked out MacPro Tower. Just another way we can save our users a few dollars. Also cloud sharing. All the Google Drive file sharing tools work for Drafty. Make a pre-plot and share with your assistant to finish off the data entry. Share the plot with your electricians and let them enter all the dimming and circuit information. No more “Passing the football.” You just work. 5. Is there a mobile app for Drafty? It is on our development list but currently you need a laptop or desktop. That computer can work on or off-line and Drafty syncs to the cloud as soon as it has an internet connection again. 6. I know that the program is still quite new. Do you have any ”big names” using it yet? Richard Pilbrow. I met him at USITT this year. He’s a real advocate for new technology which is wonderful to have in a field so reliant on technological advancements. When we met, he seemed almost more excited to meet me than I was to meet him. “You’re Lucas who made Drafty? Brilliant!” His enthusiasm is so infectious I forgot to be nervous. He really put us to the test. The largest file I had tested with Drafty before he got on board was in the 400-450 unit range. He was putting out a plot well over 600 units. We added a bunch of symbols for him too. The Robert Juliat 700 Series? You can thank Richard for wanting those. 7. How does the program deal with generating paperwork? I know it creates lighting paperwork, but are there other applications for sound or video? Our Signal Flow tool is getting a fair bit of attention. Simple drag and drop interface for doing all your signal routing diagrams. We have a rack builder on deck but it may be a couple months yet to really get it right. We just partnered with Sam Kusnetz of Team Sound NYC, makers of Go Box for QLab, to deliver high-quality real-world accurate speaker symbols available as an in-app purchase in Drafty. Those ought to go live very soon. We will be deploying a Screen tool for Projector calculations with our next revision at the end of May. Again, simple drag and drop to resize your screen and move the screen and Projector independently with a real time readout of the minimum lens necessary. We have a one-click Hook-Up generator for lighting that outputs a pre-formatted Channel Hookup and Instrument Schedule. On our development list is a similar set of paperwork for Audio. I hope to see it live some time this summer. We have a long list and a small team. The application is in very active development. We are on a monthly revision cycle and try to provide a solid combination of performance enhancements and feature additions with each release. Sound and video design paperwork tools in general are not as sophisticated as what lighting designers have available to them. We are actively closing that gap. 8. What is process like to transfer work from another CAD program? You can import PDF currently. Most CAD programs have some kind of ‘viewer’ tool that will let you format the native file into a proper PDF to draft a plot. DXF I/O is on the list. But honestly redrawing a plot is probably your best bet because it really is that fast. Chances are you would spend more time on cleanup of an old file than just drafting it new. There’s a learning curve as with any piece of software but it’s a shorter curve with Drafty than most other graphics programs, and once you get the swing of it, making a lightplot is at least 3-6 times as fast as other CAD programs. Drafting has always been one of those important catch all skills that is important to people in a wide range of design / tech jobs in the entertainment industry. Lighting designers, scenic designers, technical directors, props artists, even sound guys will all have to generate some type of mechanical draftings at some point in their careers. Traditionally speaking, this meant hours spent hunched over a drafting table with a T-square, triangles, pencils, and high threshold for pain and frustration. With computers becoming a ubiquitous tool in every design studio, most designers these days have left behind their drafting boards and traded them in for some type of a CAD (computer aided drafting) solution. While there have been dozens of programs over the years to offer a digital replacement for hand drafting, in the entertainment industry the two most commonly used programs are AutoCAD by Autodesk and Vectorworks made by Nemetschek. Both of these programs are robust, powerful CAD solutions that offer 3D rendering capabilities and a wide range of add-ons for just about every use one could imagine. Not surprisingly, both of these applications are as expensive – in the thousands of dollars – as their options are extensive . Recently, a newcomer to the field called Drafty is challenging the notion that a CAD solution has to be either bulky or costly. The Drafty model is to offer a computerized drafting solution that feels like as much like the old pencil and paper model as possible. I recently sat down for a chat with Lucas Krech, one of the creators of the software, to chat a bit about their program and what makes it unique. The following questions are the first half of that interview. 1. If you had to sum up Drafty in an elevator pitch, what would you say? Drafty brings the ease of hand-drafting and the precision of CAD to the 21st century mobile designer living in the cloud… Is this your floor? 2. What are the origins of the program? I used MiniCAD and then its rebranded Vectorworks incarnation, becoming a power user up to and including having my 3D drafting featured in several getting started guides. I remember the excitement when they came out with their ‘Spotlight’ module as it appeared they were giving real attention to theatrical designers. Sadly, it turned out that despite the additional cost of those tools you still needed to spend hundreds of dollars on 3rd party plug-ins just to make it mostly work. And it was still slower than drafting by hand a lot of the time. Certainly for beam sections and layouts. Plus the cost of the software is just unreasonable for a theatrical designer. It is priced for their core market of architects who make hefty 6-figure salaries. And I can respect that. But, I’ll tell you a secret, I’ve never made 6 figures with my design work. I know people regularly working on Broadway who don’t. So how can I justify paying for software aimed at that market? I can’t. We did it because there were no other viable options. But I wanted to see a good, dependable tool for the hardworking artists out there who may be taking gigs for $500 or $1,000 dollars. Or less! You shouldn’t have to work hard for two months creating art to barely afford a tool that you then need to rebuy in a year or two because they don’t do patches for OS upgrades. I’ve also done some teaching and seen really bright, intelligent students with an affinity for light become blocked when presented with traditional CAD programs. I wanted to remove that barrier. I wanted it to be easier to draw a light and a pipe and have them intuitively relate to each other in a way a novice could understand. Further, in a real world scenario I would use, as a power user, maybe 10% of the tools. If I only need 10% of the tools why not make a program that has the 10% I actually need, is built from the ground up to make a plot, and costs 1/10th the price? And that’s the seed of Drafty. I know a lot of people in the software industry. My wife is a lifelong tech veteran having worked for OSC, Apple, and others. She also develops independent apps for iPad. Watching her work on her iPad App, The Recipe Box, got me thinking about an easier interface for drafting. I knew what should be possible, I just didn’t have the skills to do it. I stewed on the idea for about three years and then chatted up my friend Max, who I knew had a keen interest in graphics programming, while we were out camping last summer. I pitched him the idea and he told me to send him a functional spec. I dutifully went home, researched “What is a functional spec?” and “How do you write a functional spec?”, wrote one up and sent it off. He took a look, thought it could be a fun project, and we began prototyping. 3. There are a lot of solid, time-tested drafting applications on the market. What sets Drafty apart from those? I would actually flip this question around and ask what makes every other graphics program on the market the same? Vectorworks, AutoCAD, CorelDraw, Photoshop, SketchUp, Illustrator, you name it, all do more or less the same thing. Sure, the tool sets are slightly different and they are optimized for different versions of precision (pixels, inches, percentages) but they are all essentially a big box of pencils, pens, drawing templates, and paper. Dimensions are a snap, literally. We don’t have arcane graphics relating to myriad versions of the same tool for slightly different purposes. We have a button called ‘Pipe’ which you press and get a rectangle whose length can be scaled and whose depth is fixed at 2.5”. We have a button called ‘Light’ which you press and get a realistic looking outline of a Source-4. Grab the light, move it on to the pipe. It snaps into place and gets numbered ‘1’. Duplicate the light and the copy is numbered ‘2’ and duplicates along the pipe by default. Drag the pipe, its lights follow. Students can begin learning the basics of graphic layout for Lighting Design by using the program because we intentionally made it hard to do your paperwork wrong. We have a ton of overrides, and more coming, for users who want more control or to cover edge cases but 90% of the time the tool just does what you want it to do and saves you a bunch of time on data entry. Thanks for reading. If you like what you’re reading, please share it with a friend and follow my blog. In part 2, we will be talking with Lucas about paperwork, signal flow, and importing from other CAD programs. There’s also news about Drafty’s new partnership with Team Sound and Field Template for high quality CAD symbols available through Drafty as in-app purchases. See you then.